Artificial sweeteners are commonly used by people with diabetes. These days it is also used by people who want weight loss. These are found in many foods and beverages that are marketed as "diet," but need not necessarily be healthier than ones without artificial sweeteners. When used in moderation as part of an overall balanced diet that is full of nutrient-rich foods, they can help contribute to weight loss, weight management and support a healthy lifestyle. Generally speaking, they should not be used to replace all the sugar in the diet, as the body needs sugar to create energy. • Artificial sweeteners are used to sweeten food and drinks without using as many calories as sugar, and many sweeteners are calorie free. They are often sweeter than sugar, so less of a substitute can be used to obtain the same level of sweetness that comes from using sugar. • Not only do they help to control calorie intake for weight control, but they also do not contribute to tooth decay. • A hazard associated with artificial sweetener has more to do with usage than it does with its chemical makeup. 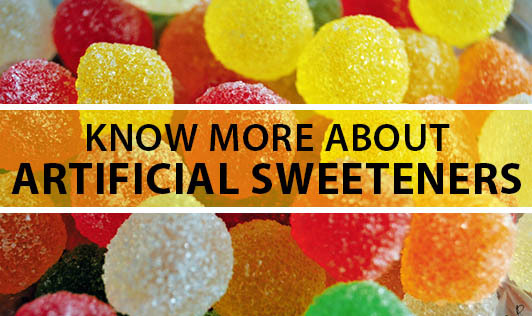 • These sweeteners are often found in processed foods that can still contribute to weight gain. Many "sugar-free" foods still have high calorie and fat content from other ingredients. • It is important to note that when eaten in large amounts, sugar alcohols can cause a laxative effect on the body. • Pregnant or lactating women are encouraged to check with their physician to determine the safety of using sugar substitutes.